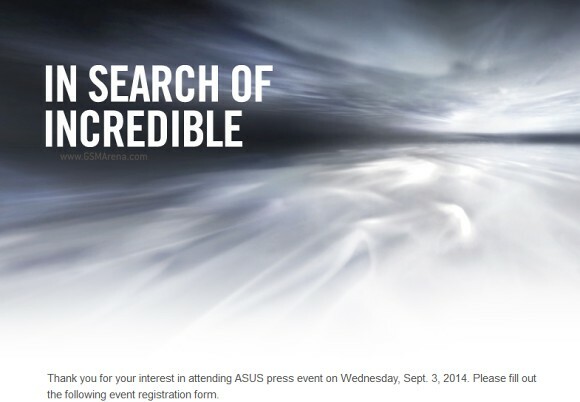 Asus will be attending the IFA fair in Berlin as usual and has sent out invitations for its press conference, which is scheduled for September 3. The invite doesn't divulge anything about what new hardware we're going to see from the Taiwanese maker but carries the now go-to In Search of Incredible motto. In this year alone Asus has unleashed 8 phones (including 3 PadFones) and 7 slates and transformers but we may get to see new ZenFones and a smartwatch. Last year's IFA floor saw a slew of ASUS hardware debut so we're hopeful this year's event won't let us down either. Hey, Asus! How about changing the invites? I think it is the third time when you use the same invite. Hey Asus, please release ZenFone 6.5"phablet with high end spec but half price of what Galaxy Note 4 costs. ZF6.5" must be better performance than Note 4, Xperia Z Ultra, HTC One Max, Lumia 1520. I love "Asus Transformer Book T100", a low-cost 10-inch Windows 8.1 tablet that can also function as a laptop thanks to its keyboard segment.